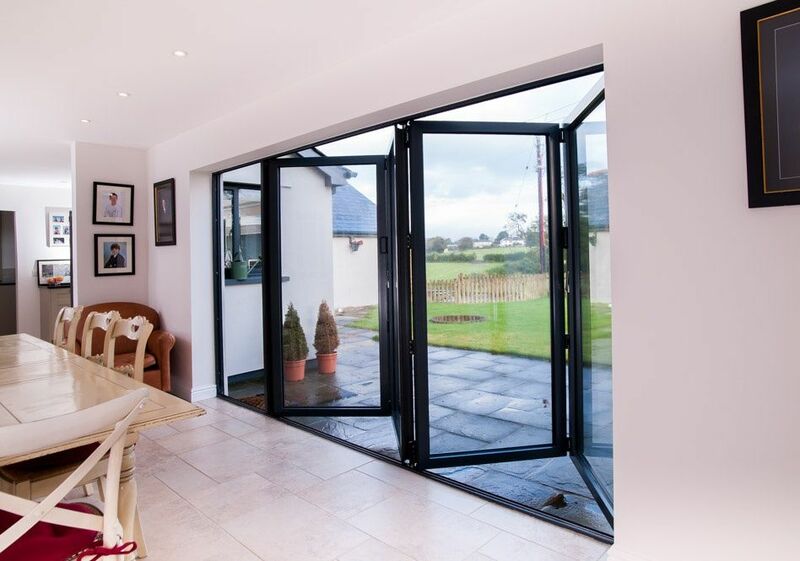 Dartmoor Windows work in partnership with a large local fabricator to help create our SMART profile Bifolding Doors and a local specialist manufacturer to produce the double glazed sealed units. Working closely with our fabricators and manufacturers offers us more control of the quality of the finished product and, in turn, more variety to our clients with the glazing and hardware preferences that go into creating your unique made to measure Bifolding Door. Available in a wide range of door leaf combinations. These high security Aluminium Bifolding Doors are produced using the same SMART profile system as the windows and other door types; keeping the continuity of our Premier Range. High security, insurance friendly multi-point hook locks, keyed alike barrels hinges and, depending on the system choice, either internally or externally glazed (including security fixings for externally glazed), all help create these undoubtedly safe, strong doors which, with slim, elegant architectural lines, the correct style, design and finish, are suitable for a range of properties. COLOUR FINISHES - Our Premier Range of aluminium products manufactured by REAL are available in stock colours of White, Anthracite Grey, Anthracite Grey on White, and Black. (Please note, the stock colours all fall under the same price bracket). A large selection of other colours are available from the RAL colour range thus allowing your bespoke doors to blend perfectly into the scheme of the building and its internal rooms. (Please note, non-stock colours come with a slightly longer lead time). GLAZING - Our Premier Range of aluminium windows can be glazed to the required specification of a project and comply to meet current building and glazing regulations.